We are wrapping up the Mastodon Army Men figures. These items are part of a benefit auction that will be available soon. 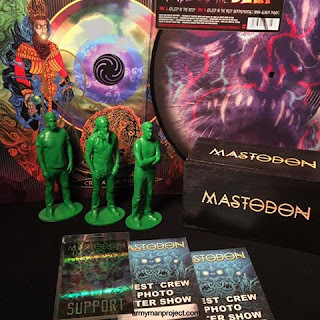 The set includes a copy of Crack the Skye vinyl (signed by band) Asleep in the Deep picture disc, 2 souvenir concert laminates, 1 holographic souvenir laminate. Troy, Bill and Brann 5" 3D printed Army Man figures from 3D scan we did while they were in Tucson. Laser engraved slide top box for the figures. Also included but not pictured: 3.25" versions of figures in autographed packaging. All items were generously provided by the band. We thank them for their involvement. More info soon regarding the benefit auction date.